This is a true story and every event actually happened. I apologize in advance for the length, but it is worth reading, I promise. Written by Erica George and edited by myself for this post. I am posting this story for my granddaughter Carly and her family and so that everyone can share in “Our Little Hummingbird” miracle. In Traditional Native American culture, a hummingbird symbolizes timeless joy, freedom and energy. It is a symbol for accomplishing that which seems impossible and will teach you how to find the miracle of joyful living from your own life circumstances. The hummingbird is thought to be a messenger of love and joy. It teaches a person about self discovery and healing. The hummingbird being the tiniest of all birds is thought to bring “special” messages. It teaches us to adapt to whatever life may hand us. When my daughter Monica found out she was pregnant with her second child, we were thrilled. Early on the in pregnancy she began spotting and we began to worry. Monica came over to my house to relax and get a little moral support. After a few minutes she realized she had left something in the car and went to get it. As she approached the car, there was a little hummingbird fluttering right at the trunk, almost as if it were waiting for her. Monica froze and watched as it floated there for what seemed like forever and then it flew away. She felt a rush through her body and ran back in to tell me about it. We looked at each other and smiled. We both felt the spirit of my mother (Grandma Inez) who was a big influence in Monica’s life. Could it be? Was it a sign to let us know everything would be okay. From that day forward we called Monica’s belly “Our Little Hummingbird”. A week or two passed and again while visiting my house, Monica was greeted by the hummingbird and again it was right by the trunk of her car. Coincidence? A few months had passed, all was going well and Monica took her other daughter Holly shopping at the Disney store, a trip they make quite often. While Monica was concentrating on the clearance rack (that’s so Monica), Holly casually walked up to her and said “here Mom-Mom” and walked away. Monica lost her breath was she realized Holly had handed her a little plush blue hummingbird (Flit) from the Disney Pocahontas movie. Now it is important you know that Holly is only 2 years old, has never seen the movie nor did she know that character. 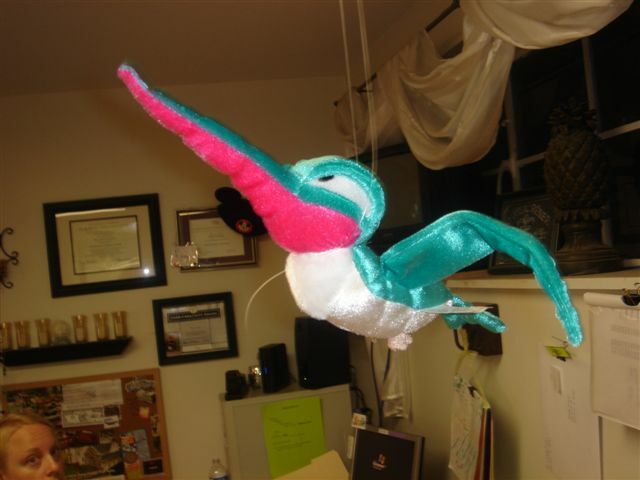 Of course Monica purchased the bird and hung it above her desk at work, where it still flies today. Monica had never seen Flit at this particular Disney store before that day, nor has she seen it for sale since. Coincidence? More and more time had passed and Monica was having a wonderful uneventful pregnancy, all the while referring to her belly as her hummingbird. One day at work, co-worker Betty asked why we referred to her belly as her hummingbird so we proceeded to tell her our story. After the story, Betty looked at us with a special look and told us that she has collected hummingbirds for years and had decided to sell some of them. Later on, I approached Betty about buying one as a gift for Monica after the baby is born and asked Betty to choose anyone that she thought was special. We thought it was very odd that of all the figurines to save, she happened to save hummingbirds and that she had just recently decided to sell them off. Coincidence? The day had finally arrived and Monica went into labor. We were all so excited to meet our little hummingbird. Monica had invited myself and my other daughter Erica to experience the birth with her, so Erica made arrangements for her daughter, Reese to go to her other Nanny’s house and spend the night like she so often does. One of the things that Nanny does when she babysits is they do crafts together. Gail has a big craft room. The following day Gail brought Reese home and proceeded to tell Erica about all the things they did and handed Erica a bag of all the crafts they had made. She said there was a special gift inside that Reese had made especially for me. As she pulled it out of the bag, a rush of heat ran through Erica’s chest as she held back the tears. 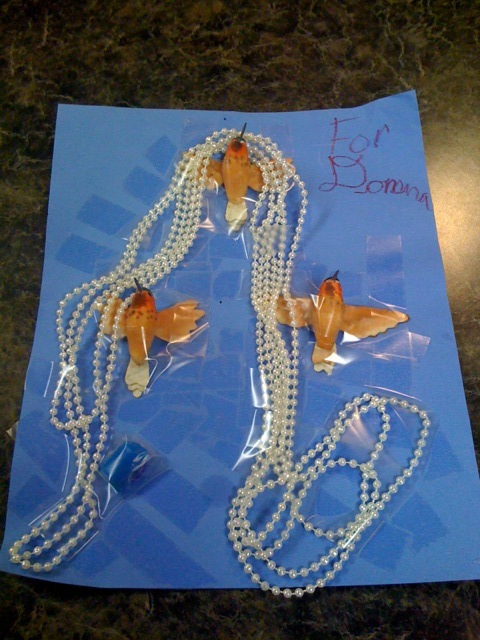 It was a blue piece of construction paper with three hummingbirds glued to it and draped with pearls. Gail was puzzled at Erica’s reaction. You see, Gail did not know the hummingbird story and what were the chances she just happened to have hummingbirds in her crafts and that Reese would choose them. Coincidence? The night Carly Inez was born was one we will never forget. It was filled with many highs and lows. When Carly was born there were complications and she was rushed to NICU, at the same time things were going wrong with Monica and she began to hemorrhage and they couldn’t find the cause. We were devastated to think that we could lose both Carly and Monica, it was unbearable. Very quickly they realized that Carly needed to be transferred to Riley’s Children’s hospital and Chicago had no beds so she was being transferred to Indianapolis. It was storming so they were unable to send the helicopter so we had to wait two hours for the ambulance to pick up Carly and drive two hours back to Indy. By morning Monica had stopped hemorrhaging so we stayed with her and Jody went to Indy to be with Carly. As soon as Monica was released Jody came back to get Monica and pack their bags because they were going to need to stay with Carly in Indy for an undetermined length of time. Before they headed out they stopped by the office and I decided it would be a good time to give Monica the Hummingbird figurine to help cheer her up. 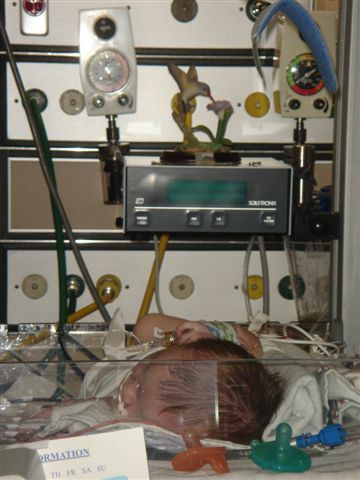 Jody encouraged Monica to bring it along because they could put it near her crib in NICU. While driving to Indy they got a call from Ronald McDonald House saying they needed to get there ASAP because they had one temporary room available but they needed to sign in by 8:30. They hurried to get there and made it just in time. The room was small with just a bed, a deck and a chair. While Monica was getting settled, Jody noticed a spiral notebook on the desk. It was there for guests to write in, tell their stories, thank yous and words of encouragement. Emotionally exhausted, he pick up the book and opened it to the first page. He stopped, began to tear up and could not believe what he saw. On the very first page someone had drawn a hummingbird. Up until that moment Jody really did not truly understand the whole hummingbird thing. He looked at Monica with tears and said “I understand now. Carly’s going to be okay – I know it now”. He handed Monica the notebook and they both cried. Coincidence? We think not. Notebook page 1 in the last room available. 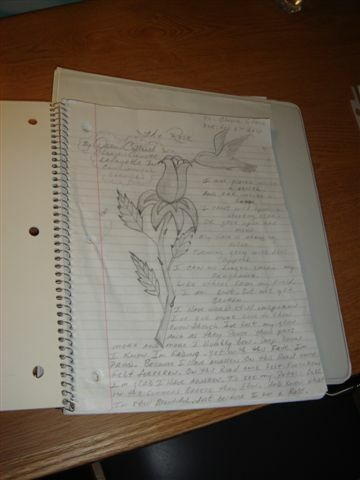 The very first page of an ordinary notebook in the last available room. What are the chances? It was that moment that Monica knew in her heart what had actually taken place. The hummingbird that came to visit her at the trunk 9 months earlier had stayed with her throughout the pregnancy and birth to help her get to that final moment. Carly’s guardian angel? Maybe. Carly was discharged as a healthy baby girl 11 days later. Whether you believe is special messages or not, there are miracles happening everyday all around us..we just have to take a moment to notice them. Random me: I cry every time I read this story. What a story. Totally worth the time to read. Inspiring. Comforting. Our God is an awesome God. I can’t hear that song without crying too. Celtic Women do an awesome version. Thanks for following and for this heartfelt comment. It takes a strong person to be able to cry (at the feet of Jesus) in the midst of daily life, at God’s miracles, and in the presence of human frailty, to see what Love can do. My girls and I were very close to my mother. There have been a few incidences since her death that caused us to literally sob. One other occasion was at the wedding of my daughter Monica. There is no doubt that her spirit was sharing that day with us. Truly can’t read this without tearing up. To all the Flanagin/Decker/George women, may they always feel the love in this story for generations to come. I will think of this story every time I see a hummingbird. Thank you for sharing! Thank you David. I always thought hummingbirds were amazing, even more now. Tears and goosebumps all at the same time! Thank you for sharing this story! Thanks for reading Debbie. Hard to write that story and get the true feelings into it. Hummingbirds will always have a special place in our hearts. Olga, thanks for reading and commenting. Hope all is well with you. Spring is near 🙂 !! This has been even more meaningful reading it a second time, 7+ years after you wrote it. 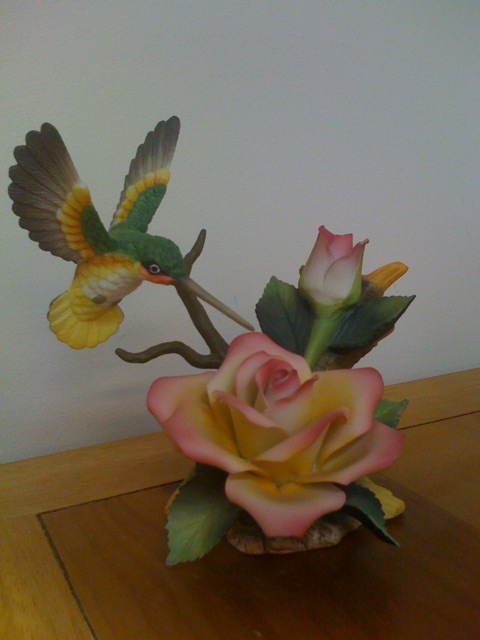 Thanks for the link today – what a wonderful opportunity to re-experience the Magic of Hummingbird Love. Grateful wife, mom of 2, grandma of 4, bulk mail business owner, Disney FANatic, wisdom seeker, all rolled into one happy lady.